On January 1, 2017, a single Bitcoin (BTC) cost $997.69. On December 31, 2017, that same Bitcoin cost $13,860.14, and 6 months later… $7,518.24. The price has dropped over 80% in 2018 — from $17,135.89 at its highest, to $3,640.56, at its lowest. This article is meant to address these concerns. I will put these numbers into perspective and show you how to understand and position this volatility within crypto’s larger history. I will focus on BTC because it is the first cryptocurrency, thus, it has the longest history. I also believe it has incredibly strong fundamentals. However, most other cryptocurrencies have also faced similar (and often more dramatic) price swings over the last year, as the market usually follows BTC’s lead. If you want to invest in the space, or even follow it from a distance, it is helpful to have an idea as to why price swings and volatility occurs (and where we’re at in the cycle). To truly be informed about the sector, it is vital to know about BTC’s price history. There are several factors that cause these crashes…some appear to be the result of a single action while others are a combination of numerous elements within the crypto ecosystem and global current events. Without going through every crash listed above and speculating about their exact causes, I want to aggregate the main reasons I believe the space is so volatile. The Bitcoin whitepaper was released on October 31, 2008 by Satoshi Nakamoto (who has remained anonymous) — only 10 years ago! And since Bitcoin, and the blockchain technology that it is built upon, has only been around for just over a decade, there is still a heated dispute about its primary use cases and fundamental value. Satoshi originally designed BTC to be used as “electronic cash,” a decentralized currency that allows transactions to take place online, disrupting legacy financial systems. However, due to Bitcoin’s growing popularity and substantial price increase, unforeseen issues have arisen. Each transaction uses a significant amount of electricity, meaning that it can run into difficulties as a currency for day to day use because of long transaction times and high transaction costs. The narrative has shifted in recent years, as BTC is commonly referred to as “digital gold.” 21 million is the maximum number of BTC that will ever be in circulation. This hard cap makes the currency “deflationary,” meaning that there is an expectation that the price will increase as scarcity increases, creating incentives to hold on to it. Lately, due to BTC’s dramatic price surge and countless token projects launching in the last 24 months, it has turned into a speculative asset and fundraising mechanism. The narrative is constantly changing as new developments impact how people use and understand the currency. This makes the market extremely reactive. One piece of news can greatly impact the price…within minutes. There is a very small (and elite) group of people who own the majority of BTC. As of late 2017, it is estimated that approximately 40% of Bitcoin is held by only 1,000 people. This means that control is centralized and one trade can move the market. There is considerable evidence that price manipulation occurred during the 2013 and 2017 bull runs. In 2013, there were two “autonomous computer programs” running on the Mt. Gox exchange, where 70% of BTC transactions took place at the time. 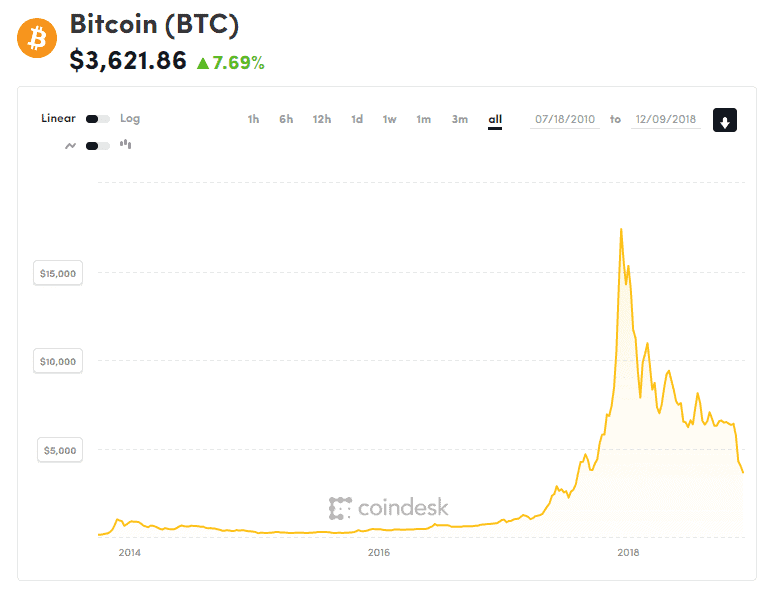 Bitcoin’s value went from around $200 at the start of November 2013 to a peak of $1,147.25 by the start of December — then plummeted back down, reaching a low of $522.23 by mid-December. There is also much speculation that it was an inside job. There is suspicion that the 2017 price rise was in part orchestrated by Tether (although these claims are disputed). Tether is considered a “stablecoin,” meaning that it is (supposed) to be backed by the U.S. dollar, although it seems that it was used to both “stabilize and manipulate” the BTC price. As part of Cyprus’s bailout in March 2013, a condition was put in place where a fee would be taken from most bank accounts holding over 100,000 euros. The BTC price increased by over 300% in 3 weeks, as the wealthy wanted to get their money out of the country’s financial system. In terms of more recent announcements, China banned ICOs in September 2017 and the BTC price dropped $200 immediately. There was also a major price spike in late November 2017 when South Korea’s second largest bank revealed they were testing a Bitcoin vault and wallet service. BTC increased by $1,500 in just 3 days after the announcement. Gawker published an article on June 1, 2011 entitled, “The Underground Website Where You Can Buy Any Drug Imaginable,” by Adrian Chen, highlighting a major use case for BTC (buying things illegally online). The BTC price went from $9.51 to $29.60 within a week of its publication. The Mt. Gox hack of 2014 is the most famous hack in BTC’s history. The exchange stopped all withdrawals on February 7, 2014. On February 24, a report was leaked which revealed the exchange had 744,408 Bitcoins stolen, and on February 28th, the exchange filed for bankruptcy. The BTC price went from $853.02 on February 1 to $543.93 on February 28. In January of 2018, CoinCheck, one of Japan’s largest exchanges, was hacked — losing approximately $400 million worth of cryptocurrency. The BTC price dropped over $4,000 in the 10 days after the announcement. Boom and Bust Cycles – Where to Now? It is difficult to predict where the BTC price will be in 3 months, 6 months or a year, as indicated by the various factors outlined above. This uncertainty is why I base my understanding of the crypto markets on a framework developed by the economic historian and scholar Carlota Perez, in order to better contextualize price moves and make more informed conjectures as to where I think BTC is headed. I love the model presented in her book Technological Revolutions and Financial Capital (2002). This is an extremely influential text in the crypto and technology space. Founders of some of the most successful and innovative tech funds in North America have offered praise. Fred Wilson, co-founder of Union Square Ventures (Twitter, Etsy, Coinbase, Tumblr), explained that it “is the framework I like to use when thinking about new technologies.” Joel Monegro and Chris Burniske, cofounders of Placeholder Capital, a specialized crypto fund, also use the model as a basis for their investment thesis. The book presents a framework for understanding the boom and bust cycles of “disruptive technologies.” It was published in 2002, immediately following the dotcom crash, and it accurately predicts how the digital economy and technology markets have evolved over the past 15 years. Perez presents a model by examining the last five “technological revolutions” beginning with the industrial revolution (1771–1829) up to the information age (began in 1971). Blockchain technology and, by extension, cryptocurrency, is a technological revolution that I believe mirrors the cycles of past technological revolutions. This is why her model is a valuable tool in understanding where the crypto sector is going. In order to better grasp the boom and bust cycles of crypto, I have briefly outlined her arguments below. According to Perez, there are two stages of a technological revolution: the Installation Period and the Deployment Period, each spanning approximately 40–60 years. There are also two parts within each of these stages, whose characteristics are detailed next. Irruption Phase: Revolutionary inventions appear. There is substantial funding of these technologies and optimism about their potential. New industries emerge and infrastructure starts to be built up around this technology. Frenzy Phase: Frantic investment occurs, resulting in a stock market boom. Investment fundamentals are unimportant; scams and corruption increase. Most importantly, with this onslaught of financial capital, infrastructure can be further developed including suppliers, distribution channels, skilled labor, cultural adaptation. Turning Point: There is a crash…the bubble bursts. This is necessary for wide spread acceptance and implementation of the technology, as the downturn encourages regulations and institutions adjust to this revolutionary technology. Synergy Phase: The infrastructure that was established in the Frenzy Phase, and the regulation and institutional adjustments during the Turning Point, now allow for the distribution of the technology into the larger economy. Infrastructure has matured, meaning that applications can be developed on top of it. Consumers become more familiar with the technology as it becomes easier to use and more widespread. Framework to understanding revolutions technologies as developed by Carlotta Perez. If you want to invest or even just simply follow Bitcoin, I think it is essential to know about its price history and have an investment thesis. BTC is still early in its development and incredibly unpredictable, so it is crucial to know the risks that come with that. Reflecting on Perez’s framework, Bitcoin (and the crypto industry in general) appears to have been in the Frenzy Stage in 2017 and is now moving into the Turning Point, as institutions and regulators are becoming increasingly involved in the sector. ICOs (Initial Coin Offerings) in 2017, raised about $6.6 billion. This onslaught of capital into the ecosystem came with its fair share of corruption and scams, but I am hopeful that it can also fund the infrastructure that crypto needs in order to really breakout to the mainstream. There are several issues around scaling, custody and user experience that still need to be addressed before widespread adoption can occur. I know this volatility, and in particular, this bear market, gives naysayers a reason to call crypto a fad, and believe it is a technology that will simply never work or be widely adopted. With these objections in mind, I would like to end off the article by reminding you of Bitcoin’s revolutionary potential. BTC allows you to transport money across boarders without an intermediary. This is done with no institutional gatekeepers, no central authority and without a bank account – this is new. Considering this information, I believe Bitcoin is a revolutionary technology and we are on our way to full scale adoption. The crash may be a positive thing in the long run. These numbers are current as of December 1, 2018. “How Long is this Crypto Winter? 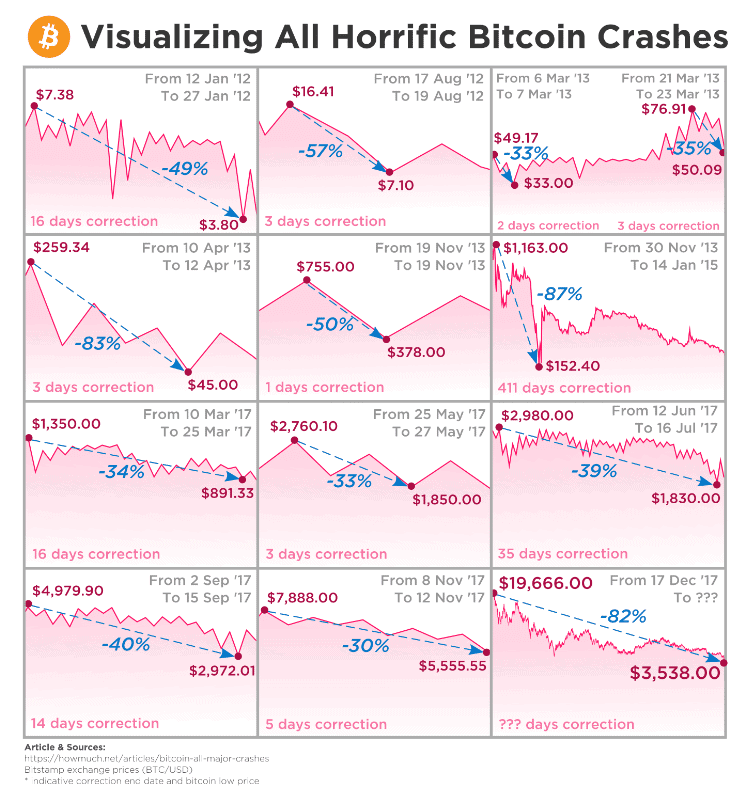 Putting the Bitcoin Crash into Perspective,” HowMuch, June 28, 2018, https://howmuch.net/articles/bitcoin-all-major-crashes. Satoshi Nakamoto, Bitcoin: A Peer-to-Peer Electronic Cash System, October 31, 2008, https://bitcoin.org/bitcoin.pdf. Olga Kharif, “The Bitcoin Whales: 1,000 People Who Own 40 Percent of the Market,” Bloomberg, December 8, 2017, https://www.bloomberg.com/news/articles/2017-12-08/the-bitcoin-whales-1-000-people-who-own-40-percent-of-the-market. Paul Vigna, “5 Things About Mt. Gox’s Crisis,” The Wall Street Journal, February 25, 2014, https://blogs.wsj.com/briefly/2014/02/25/5-things-about-mt-goxs-crisis/ and “Bitcoin bots bought millions in the last days of Mt. Gox,” The Guardian, May 29, 2014, https://www.theguardian.com/technology/2014/may/29/bitcoin-bots-bought-millions-in-the-last-days-of-mt-gox. “Bitcoin bots bought millions in the last days of Mt. Gox.” The Guardian. Matt Robinson and Mathew Lessing, “Tether Used to Manipulate Price of Bitcoin During 2017 Peak: New Study,” Bloomberg, June 13, 2018, https://www.bloomberg.com/news/articles/2018-06-13/professor-who-rang-vix-alarm-says-tether-used-to-boost-bitcoin. Maureen Farrell, “Bitcoin prices surge post-Cyprus bailout,” CNN Business, March 28, 2013, https://money.cnn.com/2013/03/28/investing/bitcoin-cyprus/index.html and “Bitcoin Historical Price & Events,” 99 Bitcoins, https://99bitcoins.com/price-chart-history/. “‘Legitimate Bitcoin’s’ value soars after Senate hearing,” BBC, November 19, 2013, https://www.bbc.com/news/technology-24986264. Yuji Nakamura, Andrea Tan and Yuki Hagiwara, “Coincheck Says It Lost Crypto Coins Valued at About $400 Million,” Bloomberg, January 26, 2018, https://www.bloomberg.com/news/articles/2018-01-26/cryptocurrencies-drop-after-japanese-exchange-halts-withdrawals. “Marc Andreessen on Big Breakthrough Ideas and Courageous Entrepreneurs,” Stanford Graduate School of Business, March 8, 2014, https://www.youtube.com/watch?v=JYYsXzt1VDc#t=2m30s. Fred Wilson, “What Happened in 2017,” AVC, December 31, 2017, https://avc.com/2017/12/what-happened-in-2017/. Joel Monegro and Chris Burniske, “Placeholder Thesis Summary,” September 2017, https://www.placeholder.vc/. 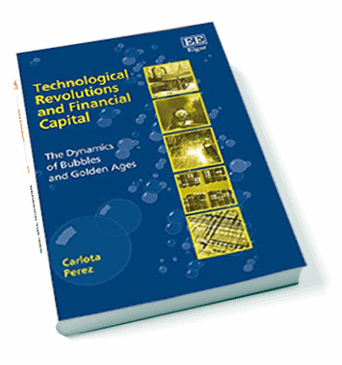 Allen Cheng, “Book Summary: Technological Revolutions, by Carlota Perez,” https://www.allencheng.com/technological-revolutions-and-financial-capital-carlota-perez-summary-pdf/. Jake Ryan, “Crypto’s Role in the Age of Autonomization,” Medium, July 25, 2018, https://medium.com/tradecraft-capital/cryptos-role-in-the-age-of-autonomization-9449c4895b2. Phil Glazer, “Cryptocurrency Regulation Update (November 2018),” Hackernoon, November 1, 2018 https://hackernoon.com/cryptocurrency-regulation-update-november-2018-d9b17837aeec; Kate Rooney, “Stock brokerage giant TD Ameritrade bets on a new cryptocurrency exchange,” CNBC, October 3, 2018, https://www.cnbc.com/2018/10/03/td-ameritrade-bets-on-a-new-cryptocurrency-exchange.html; Olga Kharif and Annie Massa, “Fidelity Starts Crypto Unit to Serve Wall Street Customers,” Yahoo Finance, October 15, 2018, https://finance.yahoo.com/news/fidelity-starts-crypto-unit-serve-163000637.html; Kate Rooney, “Nasdaq plows ahead to launch bitcoin futures despite cryptocurrencies’ bear market,” CNBC, November 28, 2018, https://www.cnbc.com/2018/11/28/nasdaq-to-launch-bitcoin-futures-despite-cryptocurrencies-bear-market.html. Previous post This Pure Play Cybersecurity Company is Setting Up For a Big Breakout! Hey Buddy!, I found this information for you: "Bitcoin Market Cycles and Price Swings – What You Need to Know". Here is the website link: https://financial-news-now.com/bitcoin-market-cycles-and-price-swings-what-you-need-to-know/. Thank you.